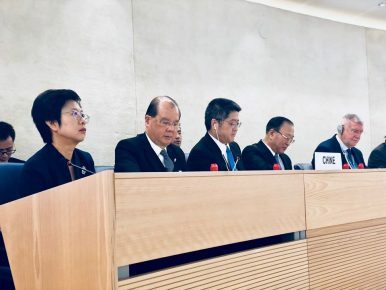 The Chinese delegation headed by Le Yucheng, vice minister at the ministry of foreign affairs, attends China's third Universal Periodic Review on November 6, 2018. Xinjiang Detention Camp or Vocational Center: Is China ‘Calling A Deer A Horse’? China defends its Xinjiang policy during the UN Human Rights Council’s universal periodic review. The World Must Save the UyghursThe Repression of Uyghurs Is Now an All-Out War Against a PeopleUyghurs: Victims of 21st Century Concentration CampsThe Muslim World Remains Largely Mute on Uyghurs’ PlightIs the Beijing Exception Finally Crumbling?